PLOT: A fictional love story loosely inspired by the real lives of Danish artists Einar Elbe and Gerda Wegener as Einar takes the ground-breaking journey to becoming Lili, a transgender pioneer. Eddie Redmayne followed his Oscar winning performance as Professor Stephen Hawking in The Theory of Everything, with the horribly hammy evil twin Balem Abrasax in the Wachowski’s stinker Jupiter Ascending. So he must have been delighted when he was offered an opportunity to wipe the lapse from his filmography with another Oscar-baiting, non-standard role as a Danish painter who became one of the first men to surgically transition to a women. The Danish Girl starts with Einar (Redmayne) and Gerda (Vikander) as a doting couple , six years married and living the happy artist life in Copenhagen. After one of Gerda’s models cancels a sitting, she persuades Einar to stand in and pose as a young lady for her latest work. This triggers long hidden feelings deep within Einar that he identifies far more with his feminine side than masculine, eventually manifesting as a transvestite alter-ego; Lili. As Lili starts to demand more and more of his consciousness, Einar’s identity is pushed out, impacting on both his own life and those around him. Gerda struggles to accept Lili and encourages Einar to fight his urges, but after realising that the only help available in Denmark would involve some form of institutionalization, they flee to Paris, where Gerda’s paints Lili to great success. A final attempt to find medical or psychological support brings them to Kurt Warnekros a German gynaecologist and pioneer in sexual reassignment surgery. With the opportunity to turn Lili into a ‘real’ woman, Einar travels to Germany for a series of operations. Unfortunately it is at this point that the film decides to use a heavy brush of artistic license, changing the true events where the couple become estranged and Gertrude remarries, to instead gush out an ‘endless love to the grave’ story, with a particularly saccharine final scene of Lili’s scarf being blown from Gerda’s hand and the final sugar-coated words “let her fly”. 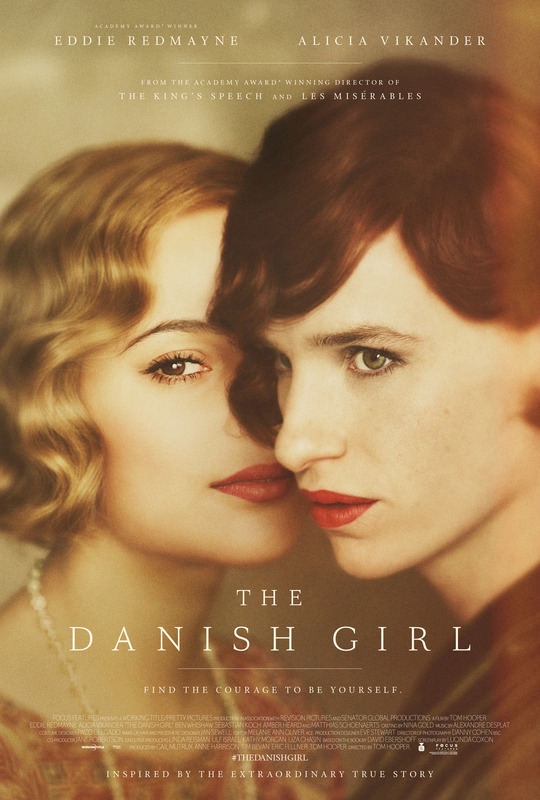 Despite the over-sentimentalised retelling of a quite interesting tale and some horribly overacted scenes from Redmayne (who does not seem to know how to forget his Motor-Neurone hands from his previous film), The Danish Girl has a lot going for it. The visuals are stunning, and Alexandre Desplat’s score fits beautifully, but it is the performance of Alicia Vikander that is the most striking and has deservedly been noticed in virtually all of the major awards nominations. Charlize Theron and Gwyneth Paltrow were both previously attached to the film and it is also understood that Uma Thurman and Marion Cotillard were considered ahead of Vikander, but I can’t imagine any of them could have given a more believable performance as a young woman struggling with a rapidly changing relationship. Tom Hooper has therefore produced an interesting and aesthetically pleasing, but ultimately flawed film that works hard to avoid the detail and instead focuses on fictionalised shmaltz. Despite the over-sentimentalised retelling of an interesting tale and some horribly overacted scenes from Redmayne, the film has a lot going for it. The visuals are stunning, and Alexandre Desplat’s score fits beautifully, but it is the performance of Alicia Vikander that is the most striking.